Premier independent festival producerÂ Danny Wimmer PresentsÂ continues to show its love forÂ LouisvilleÂ with a third addition to a massive fall festival series in the one-of-a-kind city.Â Hometown Rising, the first-ever Country Music & Bourbon Festival,Â will make its debutÂ Saturday, September 14Â andÂ Sunday, September 15Â atÂ Highland Festival Grounds at KY Expo Center, combining two ofÂ Louisvilleâ€™sÂ cultural cornerstonesâ€”great music and incredible bourbon. 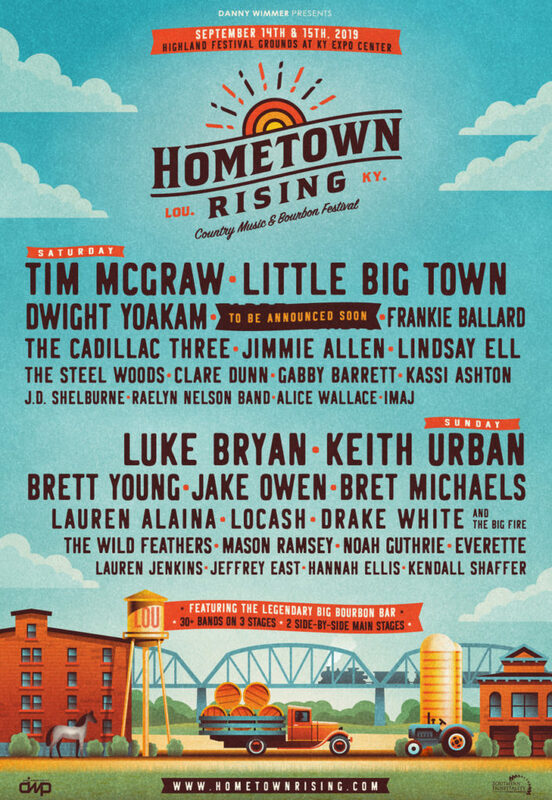 Hometown Risingâ€™sÂ incredible music lineup will be led by country heavyweights includingÂ Luke Bryan, Tim McGraw, Keith Urban,Â andÂ Little Big TownÂ with additional appearances fromÂ Dwight Yoakam, Brett Young, Jake Owen, Bret Michaels, Frankie Ballard,Â and many more. In total, more than 30 artists will play on three stages, including two side-by-side main stages, over the course of the weekend. Hometown RisingÂ exclusiveÂ VIPÂ packages,Â General AdmissionÂ tickets,Â campingÂ andÂ hotelÂ packages, as well as special event tickets go on saleÂ Friday, February 15Â atÂ 12:00 PM EDT. VisitÂ www.HometownRising.comÂ for more details. With three back-to-back festival weekends inÂ LouisvilleÂ in 2019,Â Danny Wimmer Presentswants to ensure all fans have the chance to enjoy multiple events with an affordable and convenient ticketing option. New this year, fans can purchase a specialÂ â€œTrifestaâ€ PassÂ for the discounted rate of onlyÂ $229.00Â plus fees. The pass allows General Admission weekend access to all threeÂ DWPÂ fall festivals inÂ Louisvilleâ€”Hometown Rising (September 14 & 15), Bourbon & Beyond (September 20-22)Â andÂ Louder Than Life (September 27-29). 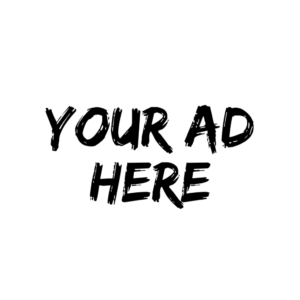 Check outÂ https://trifestapass.comÂ for more information. 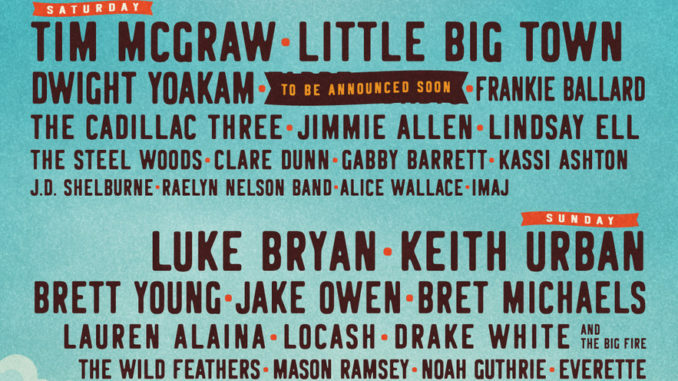 â€œI am beyond thrilled to be playing the very first year ofÂ Hometown Rising, and to have the opportunity to be part of such a prestigious and eclectic lineup of modern country artists,â€ says performerÂ Alice Wallace. Bourbon authority and best-selling authorÂ Fred MinnickÂ is the festivalâ€™s official spirits curator and has helped assemble incredible onsite experiences, including bourbon tastings and workshops for fans 21+ duringÂ Bourbon Heritage Month. The centerpiece, the legendaryÂ Big Bourbon BarÂ presented by Louisville Courier Journal, will feature more than two dozen hand-selected bourbons from top distilleries, and a unique opportunity to enjoy bourbons and exclusive one-time specialty cocktails.Â Fred Minnickâ€™s Mini Bar presented by The Bourbon Women AssociationÂ will showcase craft selections. Acclaimed Louisville whiskey barÂ The Silver DollarÂ will operateÂ The Hunterâ€™s Club, where attendees can find vintage bourbons dating as far back as the 1930s, as well as contemporary collectibles. The initial list of participating bourbon brands atÂ Hometown RisingÂ includesÂ Angelâ€™s Envy, Barrell Bourbon, Boone County, Coopersâ€™ Craft, Elijah Craig, Evan Williams, Jim Beam, Knob Creek, Larceny, Makerâ€™s Mark, Old Forester, Woodford Reserve, Four Roses Bourbon and Kentucky Peerless, with many more to be announced. Hometown RisingÂ will be followed by two consecutive weekends of festivals includingÂ Bourbon & Beyond (September 20-22)Â andÂ Louder Than Life (September 27-29). The creation and success of these events recently garneredÂ Danny Wimmer PresentsÂ theÂ Greater Louisville Inc. 2018 Silver Fleur-De-Lis Award, recognizingÂ DWPÂ for its outstanding commitment and achievement in making theÂ LouisvilleÂ community a better place in which to live and work. In addition, further strengtheningÂ DWPâ€™sÂ commitment to the community, FounderÂ Danny WimmerÂ and CEOÂ Danny HayesÂ were recently namedÂ Kentucky ColonelsÂ byÂ Kentucky Governor Matt Bevin. TheÂ Kentucky ColonelsÂ is an independent, nonprofit organization with the purpose of aiding and promoting the Commonwealth and its citizens. In addition to performances from top music artists, and various onsite attractions, attendees can enjoy a variety of local and regional food and beverage offerings provided byÂ DWPâ€™sÂ affiliate concessionaire,Â Southern Hospitality Concessions LLC. Festival attendees will be able to experience a taste of Louisville with selections from the following local and regional restaurants:Â Boss Hog BBQ, Couvillion, Doc Crowâ€™s Southern Smokehouse & Raw Bar, Eliâ€™s BBQ, Heine Brothers Coffee, Hull And Highwater, Joellaâ€™s Hot Chicken, Merleâ€™s Whiskey Kitchen, Seviche, and more. VIP ticketsÂ include entry to a VIP hang area featuring a shaded space with dedicated bars, comfortable furniture, and live audio/video streams of the both main stages, front-of-stage viewing of the main stages, dedicated merchandise stand, premium, dedicated food offerings (for purchase), air- conditioned and flushable restrooms, dedicated entrance lanes into the festival and a commemorative laminate and RFID wristband. Top Shelf VIP ticketsÂ include access to all VIP experience amenities PLUS a shaded viewing deck, front-of-stage viewing area of main/closing stage, air-conditioned lounge/tent with live audio/video streams of both main stages, all-inclusive premium drinks at two private bars within the hang area, complimentary hors d’oeuvres during lunch and dinner hours, dedicated air-conditioned and flushable restrooms, massage station, complimentary lockers with cell-phone chargers, complimentary Wi-Fi access, Top Shelf VIP concierge staff and commemorative Top Shelf VIP laminate and RFID wristband. Kentucky Department of Tourism, Louisville Tourism, Fxck Cancer x Dyin 2 Live Dreams Program, Jack Danielâ€™s, Titoâ€™s Handmade Vodka, The Music Experience, Zyn, Take Me Home, and more. TheÂ Highland Festival Grounds at KY Expo CenterÂ are located at 937 Phillips Lane in Louisville, Kentucky. Hometown RisingÂ is produced by Los Angeles-basedÂ Danny Wimmer Presents, one of the largest independent producers of destination rock music festivals in America.Â DWPÂ events include Aftershock Festival, Bourbon & Beyond, Chicago Open Air, Epicenter Festival, Hometown Rising, Louder Than Life, Sonic Temple Art + Music Festival, and Welcome To Rockville.